Welcome into the Elevage des Forges web site. 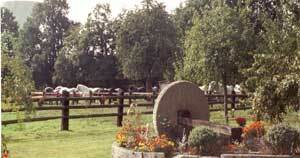 Elevage des Forges is located in the Perche, heart of the gorgeous French region named Normandy. This area, full of cultural memorials, historic buildings and well known for its gastronomy is also the land of origin of Percheron horses. Percheron horses are one of the nine types of draught horses existing in France. Horses used for a working purpose since their origin, Percheron horses were mainly aimed at agricultural and mining tasks until 1950’. From that time, they progressively passed into disuse due to an increasing use of mechanical machines. Subdued by the gentleness, robustness and several other fascinating aspects of Percheron horses, Elevage des Forges felt in love with those amazing horses more than 20 years ago. 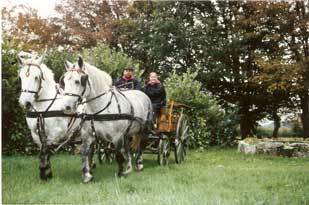 For all those years and still, it is with passion and within the respect of traditions that Elevage des Forges has been working very hard for the preservation and promotion of Percheron horses. L’Elevage des Forges is constantly preoccupied by the well being and the quality of its horses, not only regarding its range of females but also to the selection and preparation of studs. 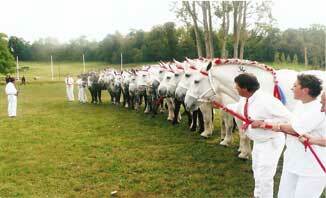 Elevage des Forges is part of all major events in relation to Percheron horses. Elevage des Forges is also a major actor of all sorts of horse and carriage activities. If you want to buy a Percheron, Elevage will try its best to make sure your expectations are fulfilled.